One of the drawbacks some gardeners have with lily varieties is the lanky foliage they’re left to deal with when the blooms are gone. What if you could have all of the beauty of the lily blossoms, without the gangly foliage? Surprise lilies are named for their sudden appearance in early fall, when they spring forth from the ground without any prior noticeable growth to announce their presence. In fact, some new homeowners are indeed surprised when they return home one day to find a stand of flowers (planted by the previous owners) where there had been nothing in the landscape before. 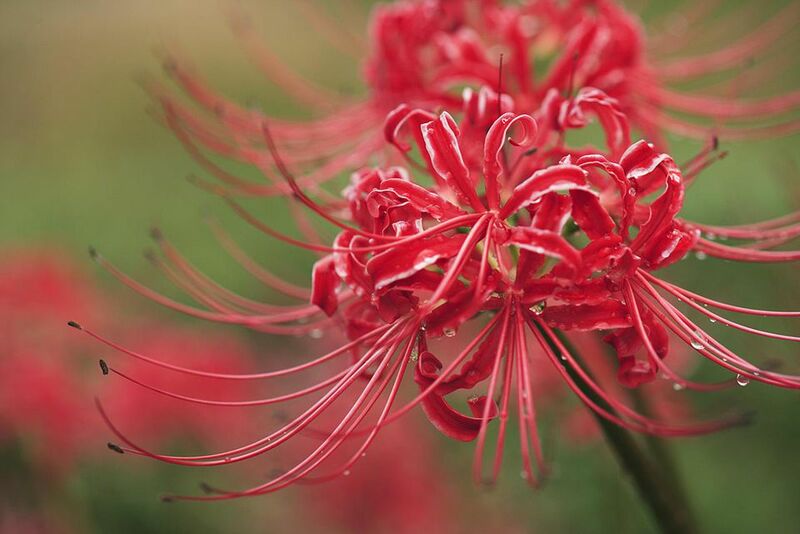 The botanical name Lycoris sounds lyrical in itself, but gardeners have bestowed many common names upon this fall favorite, including hurricane lily, naked lady, magic lily, pink flamingo flower, resurrection lily, spider lily, and surprise lily. Surprise lilies are part of the amaryllis family, and you will see similarities in the appearance and growth habit of the flowers. Like the amaryllis, the surprise lily sends up a flower stalk at a different time than it produces foliage. In the case of the surprise lily, the foliage appears in late winter, when the gardener may not notice the growth or may mistake it for daffodil foliage, which it resembles. Is Surprise Lily Right for Your Garden? Depending on the variety, surprise lilies are hardy in zones 5 to 11, but some may exhibit marginal hardiness in zone 4. Surprise lily foliage is approximately 18 inches tall. The autumn blooms appear on stems that range from 15 inches to three feet tall. By the end of spring, the surprise lily foliage will be dormant, and there will be no sign of the plant. In late summer or early fall, rigid stems bearing approximately five trumpet-shaped flowers per bulb appear in the garden. The blooms last for about 10 days. Order surprise lilies in the fall, to be planted with other spring-blooming bulbs like tulips and daffodils. Surprise lilies are long-lived perennials, so choose their site carefully so you won’t have to dig up established clumps for relocation. Surprise lily bulbs are large, similar to their cousin the amaryllis, and may reach about two inches in size. Choose the plumpest bulbs to get the best flower show in the first season. If you're dividing bulbs, you can replant smaller bulblets, but they may not flower for a year or two. Plant the bulbs about four to six inches deep in full sun to partial shade; slightly deeper if you’re planting them in a zone they’re marginally hardy in. Surprise lilies are low maintenance flowers. They don’t need any fertilization, and they don’t even mind unmulched soil. The unusual growth habit of surprise lilies helps them thrive in areas with rainy springs and dry summers, so they do not need any supplemental irrigation during their dormant period. In fact, excessive summer watering can cause the bulbs to rot. Over the years, surprise lilies will multiply to form colonies. You can divide these colonies for yourself or a friend by digging up the bulbs after the fall blooms have withered. Replant them immediately so they can establish a healthy root system before the ground freezes. As much as flower gardeners don’t like looking at plain foliage for months on end while waiting for blooms, sometimes the opposite problem can be just as awkward. The tall stems of surprise lilies have no green foil of foliage to frame them so they appear, well, naked, as the name implies. You can soften the stems by over-planting them with low growing annuals that will provide a dressing to soften their bareness, including easy flowers like globe amaranth, million bells, and sweet alyssum. You can also plant surprise lilies in the middle of the flower border, where they will peek up between plants past their blooming stage for some color in the fall garden. If your surprise lilies end up looking awkward no matter their placement, don’t hesitate to cut them for the vase, where they sometimes stay fresh over a longer period than they do in the garden. Whether you favor pink, white, red, or gold, there's a surprise lily that will shine in your landscape. Modern Japanese, a red flower introduced to the trade in 2013, is the closest you can get to experiencing flowers and foliage at the same time. As an early September bloomer, it's one of the latest to bloom, but produces foliage in late September. Recurving narrow petals and extra long stamens resemble the bloom of the Gloriosa lily.